Every year during December our solar system moves into alignment with the Great Central Sun at the Galactic Core, which is located at 26 to 27 degrees Sagittarius, forming an etheric passageway between 12.12 and 21.12 that conveys a stream of cosmic codes in escalation for the approaching surge of light during the solstice window. The fiery Sun-in-Sagittarius energy passage into December up until the Solstice can fuel a burning go-go-go need, making it easy to overindulge, over commit or overextend in the physical, emotional or cerebral realms. 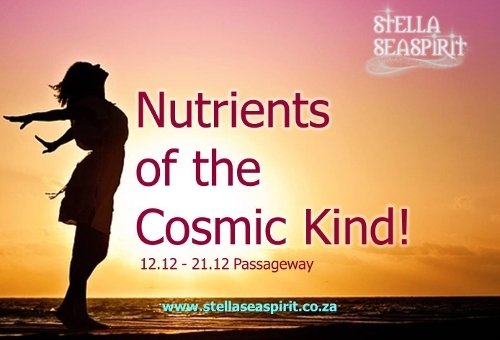 The 12.12-21.12 passageway opens from 12 December and continues streaming potently until 21 December, pouring a wave of high frequency light codes into our energy fields for the evolution of our planet and all upon it in preparation for the solstice when the sun rises at the galactic cross. This flows directly from Source, via the Great Central Sun at the Galactic Core, which is located at 26 to 27 degrees Sagittarius, showering all on Earth with high frequency electro-magnetic rays to receive whatever you need at this time to continue to raise your frequency and more fully embody 5th dimensional frequency and heart-centred consciousness. Retrieving soul fragments, healing and balancing any fear, pain or wounding within to re-integrate siphoned power and soul wisdom as it ignites the sacred geometry within every particle of your body and restores the memory held in your DNA, opening up to higher dimensional realms of consciousness in order to to align with your heart and soul truth. I Am Witch. I craft an Earth where Deep Magick is understood and honoured. This powerful energy session with me is dynamic, alchemical and intelligent in itself so it will flow to you in the perfect amount specific to your core needs as you dream your future into being and continue your spiritual expansion. Please click here for more details.